Rumor has it Shake Shack is coming to downtown Cleveland. That has us wondering about the best fast food burgers, especially chains that have recently made their way into Northeast Ohio. Which do you prefer? Read more here. You can now spin your way around Akron's Lock 3! 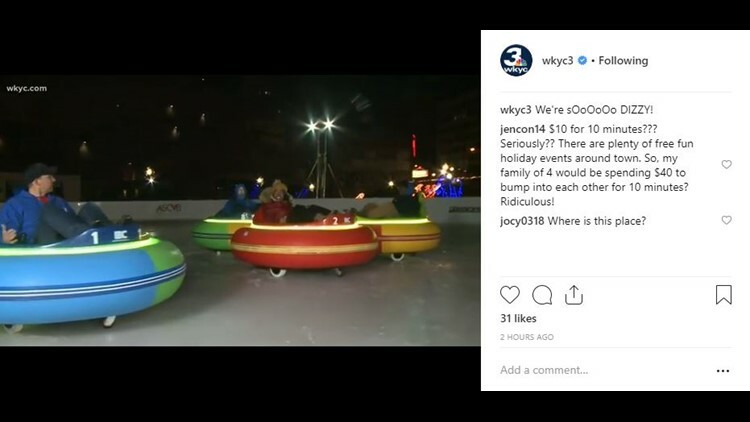 The bumper cars on ice are an exciting new way to spend a winter day. Our Jasmine Monroe had the chance to try them out this morning. What happens when you let local actress Monica Potter and our Dave Chudowsky loose in the West Side Market? Falafels and shopping ensue. Dave even has some hacks on how to find discounts there. Read more about their outing here. ODOT wants your funny and clever ideas for road sign messages to keep drivers save during the holidays. Have an idea? Learn how to submit it here. In celebration of making the 2018 playoffs, the Cavaliers unveiled their new "Earned Edition" uniforms on Wednesday, giving a special nod to the cold weather of Cleveland. Learn more about the new jerseys here. The inductees for the Rock and Roll Hall of Fame will be announced on Thursday, but fans have made their choices in a vote of their own: Def Leppard, Stevie Nicks, Todd Rundgren, The Zombies and The Cure! Las Vegas has been awarded the 2020 NFL Draft, an event that Cleveland-Canton had previously been named a finalist for. Read more about the decision and what could be next for Northeast Ohio's bid here.